Looking ahead to the 2014 calendar shows that it will be another busy year for Beckett productions in the UK and Ireland. So far, January has already set the pace with Saturday seeing the end of the sold out Royal Court run of Not I/Footfalls/ Rockaby featuring Lisa Dwan, while Tom Owen performed as Krapp at the Rose Theatre Kingston on Monday 13th January . Last Thursday and Friday also saw Company SJ perform Act Without Words II as part of the Abbey Theatre’s The Theatre of Memory Symposium. 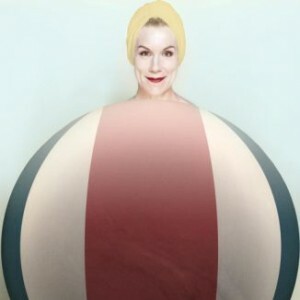 More Beckett performances are on their way as early as this week with Juliet Stephenson taking on the role of Winnie in an eagerly anticipated production of Happy Days at the Young Vic directed by Natalie Abrahami. Demand has seen this production already extend its run from 23rd January-8th March. After a two week break Lisa Dwan returns to her acclaimed trilogy directed by Walter Asmus, though this time the production moves to the Duchess Theatre in London’s West End for a two week run from 3rd-15th February. Later in the year Dwan and the Royal Court will embark on a UK, Irish and International tour. The UK dates announced so far include: 9th-13th September-Arts Theatre Cambridge, 16th-20th September-Birmingham Repertory Theatre and 23rd-27th September-The Lowry Salford. Productions of Waiting for Godot and Endgame are also planned for the Arcola Theatre, London (7th May-14th June) and the Wilde Theatre, Bracknell (5th-8th June) respectively. Happy Days will also tour to various venues around Ireland courtesy of the Godot Theatre Company. Richard Wilson, renowned for his role of Victor Meldrew in One Foot in the Grave, returns to the Beckett stage having previously performed as Vladimir in Waiting for Godot at the Traverse in Edinburgh and Royal Exchange Manchester. This time he performs in Krapp’s Last Tape at the Crucible Theatre Sheffield from 25th June-19th July. As usual Enniskillen will be transformed into Beckett Town when the Happy Days Enniskillen International Beckett Festival takes its summer residency. This year’s multi-arts festival takes place from 31st July-10th August and will no doubt once again provide a vibrant international perspective on Beckett, with global productions once again expected to descend upon Enniskillen. Beckett month in Ireland will continue with the annual TCD Samuel Beckett Summer School, from 10th-16th August, providing a rich mix of scholarship, performance and talks. This extensive list does not even take into account the numerous productions happening internationally such as Godot’s extended run on Broadway with Ian McKellan and Patrick Stewart, Barry McGovern in I’ll Go On, Mouth on Fire’s productions in Hyderabad and Pan Pan’s All That Fall touring in Sydney and Brisbane. If you have a Beckett production coming up, please let us know and we’ll add it to the list! Company SJ will present its two site-specific Beckett pieces, Rough For Theatre I and Act Without Words II as the centre piece for the exhibition: “Godot on Rubble; Beckett and Catastrophe”. These performances will run from 10th-14th June at the Tsubouchi Memorial Theatre Musuem, Waseda University, Japan, while the exhibition will be held from April-July 2014 at Waseda University. Whether it is to do with the anniversary of Waiting for Godot, or helped by the creation of the Happy Days Festival in Enniskillen, it seems that there was much Beckett in the air in 2013 – especially among some of Ireland’s foremost smaller, independent theatre companies. Pan Pan, who have recently presented Embers and All that Fall, is a good example (a link to this company’s website with images from Embers, can be found here). The Blue Raincoat theatre company, whose production of Endgame is reviewed on this blog here, is another. However there are companies who have been working on Beckett for quite some time who have presented work recently also: Gare St. Lazare Players Ireland, for example. Their production of Waiting for Godot ran in Dublin, Belfast, and Boston in October and November. Reviews of their successful international tour can be found in the following: Broadway World, Boston Globe, Edge Boston and Emertainment Monthly. Conor Lovett brought a remarkable vulnerability to his subtle Vladimir, set against a visually arresting lunar landscape. This is the second time that the company have worked on this play. However their first production came much earlier in their careers. While in the interim years artistic director Judy Hegarty-Lovett and the Lecoq trained Lovett have established themselves as among the finest interpreters of Beckett’s prose works, they have turned (or returned) now to this dramatic work. The Beckett related work that companies like Gare St. Lazare, Blue Raincoat, Pan Pan and Company SJ are currently engaging in is a clear indication of the energy that the drama still brings to the Irish theatre scene and more widely. While all these companies began life or came to notice in the 1990s and all share some connection to Ireland, Blue Raincoat and Pan Pan have only recently begun to work on Beckett’s drama. The former presented their very successful Endgame this year (2013) and the latter presented their production of the radio play Embers this year also, and All that Fall in 2012. While the fact that such innovative companies have turned to Beckett recently is notable in itself, it is also interesting to see the kind of work in which companies who have had a longer relationship with the author, like Company SJ (with Barabbas) and Gare St. Lazare, are engaging. Company SJ’s site specific production is reviewed here. It is exciting to see what new and innovative routes they are taking into the work, as well as what new perspectives on the drama are emerging because of the work of all of these companies. This is one of the key questions that the Staging Beckett Project is asking our interviewees, which include members of the above companies: just what is it that keeps these artists coming back to or going towards Beckett? 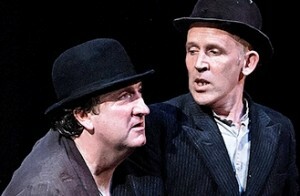 Gary Lydon (left) as Estragon and Conor Lovett (right) as Vladimir in the Gare St Lazare production. The cast also included Taig Murphy in the role of Lucky and Gavin O’Herlihy as Pozzo, seen below on the ghostly lunar set.